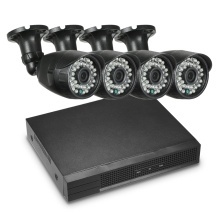 *Consist of 4CH 1080P HD WiFi POE NVR + 4pcs 1080P 2.0MP POE Wireless WiFi Waterproof Outdoor IR night view Bullet IP Camera. *Support P2P, remote playback. Remote view on mobile phone anywhere anytime. Motion detection record and phone alarm notification. *Support 4CH POE power supply. No need to do cabling for power. Support data exchange. No need to connect extra switch. *It allows camera to receive power as well as data over existing LAN cabling, which is economical and flexible for networked devices. *Advanced H.265/H.264/H265+ video compression, super low rate, high definition quality of image. Network Protocol: DHCP, PPPOE, DNS, DDNS, NTP, UPNP, IP, etc.